Laurel Hills District | Westmoreland-Fayette Council, B.S.A. Roundtable is a monthly opportunity for volunteers at all levels of the Scouting program to learn about upcoming events, training opportunities, and that month’s key topic. Volunteers and Community Members who are interested in serving in this capacity are welcome to attend one of the monthnly meetings, or contact Jesse Bush, Laurel Hills District Executive, at jesse.bush@scouting.org for more information. Our district Commissioner Corps is made up of experienced Scouters who are interested in helping your Pack, Troop, Crew or Post be as successful as possible. 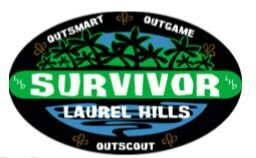 Join in the excitement of this Survivor themed camporee. Activities all designed to test your teamwork, Scouting skills and ingenuity. This is sure to be a camporee you won’t want to miss!